The government is considering an increase in cash subsidies for smaller businesses in order to help ease the burden of higher payroll costs following the decision on an 11 percent minimum wage hike for next year, officials said Monday. 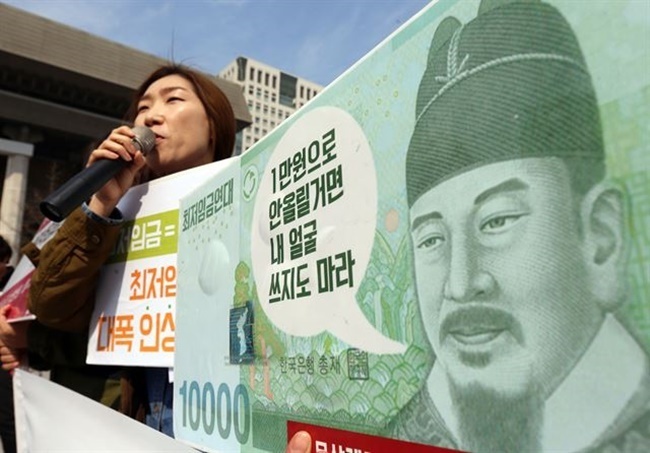 The Minimum Wage Commission decided Saturday to raise next year’s minimum wage by 10.9 percent to 8,350 won ($7.37) per hour after an overnight meeting boycotted by business representatives. This year’s minimum wage is 7,530 won per hour, up 16.4 percent from a year ago -- the biggest hike in nearly two decades. President Moon Jae-in has vowed to increase the minimum wage to 10,000 won by 2020 to achieve income-led growth. Saturday’s decision sparked angry reactions from both labor groups and businesses. While labor groups said the raise should have been higher, businesses voiced concern the hike will hurt independent shops and deal a blow to the economy. In the face of growing criticism, the Minimum Wage Committee began looking into possible support measures that could minimize the shock for small businesses, mostly self-employed, according to sources familiar with the matter. One of them includes offering state subsidies equivalent to about half of the 10.9 percent raise, which will lower the actual rate of the increase to 5.5 percent for business owners, the sources said. Businesses that fall in sectors, such as cuisine, accommodation, hospitality, small wholesale and retail, may be subject to the provision under review. When the government passed the hourly rate raise last year, it offered smaller businesses under certain categories state subsidies of about 130,000 won per worker.